I have been on a comfort food kick the past few days; Potatoes au Gratin are one of my favorite creamy delicious side dishes. We always had them as a kid sometimes from scratch and sometimes from a box. The box variety always fascinated me. The clear plastic looking chips, the powdered sauces, pour over boiling water and bake. Voila! 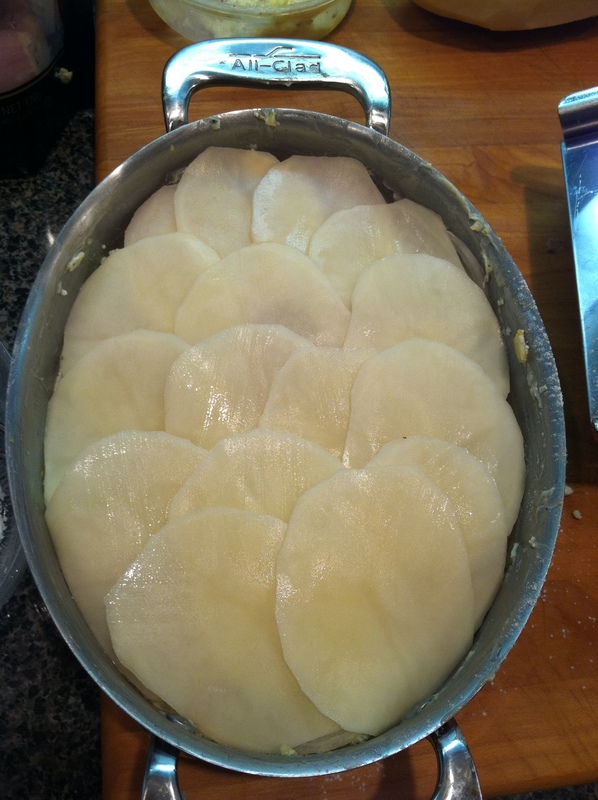 Potatoes au gratin or Scalloped Potatoes all from a box. It was amazing stuff. Making the same potatoes from scratch is far more satisfying, both nutritionally and esthetically. First you have to get some good starchy potatoes – russets are the best as they are a ‘high-starch, low moisture’ category of potato. Peeling is your option, but be sure to scrub them clean. Have everything ready to go before you start slicing the potatoes so they don’t turn colors on you. If you don’t know what I mean about potatoes turning color, take a slice and just let it sit out on the counter or on a plate. Look at it again in 5 minutes. It is oxidizing with exposure to air. Process potatoes quickly to avoid this color change happening. “Green” on the potatoes is called “Solanin” and it is a sign of a potato that has been stored incorrectly with an exposure to light. To avoid green potatoes, always store potatoes in a cool, dark place. While it would take quite a bit of solanin to cause severe damage, it is an intestinal irritant. Simply cut away the green with your peeler. It isn’t very deep. Do not store potatoes in the refrigerator, the cold converts the starch to sugar. Restoring to room temperature, over a few days will convert back to starch. I made this dish for Robert and me but it would easily feed four. 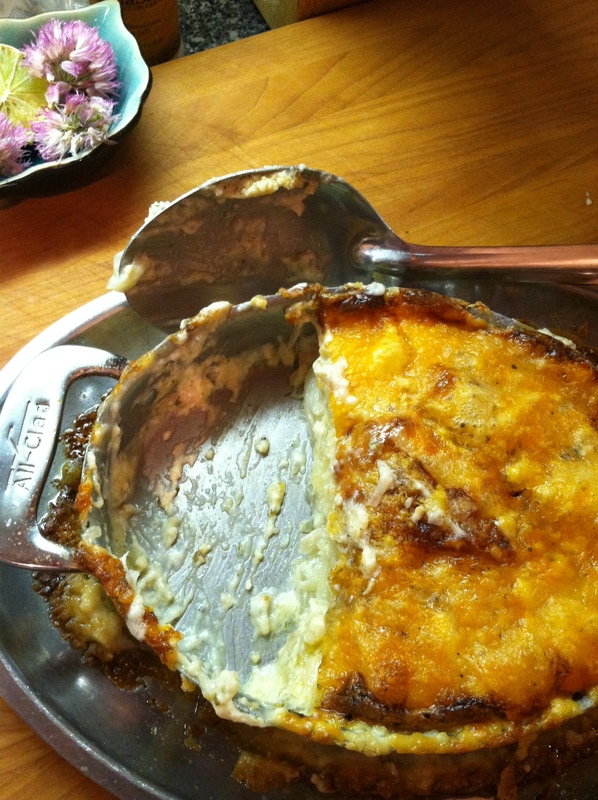 I used an All-Clad oval stainless baker pan, you can use any oven-proof dish you want. Adjust the quantities if using a large pan. 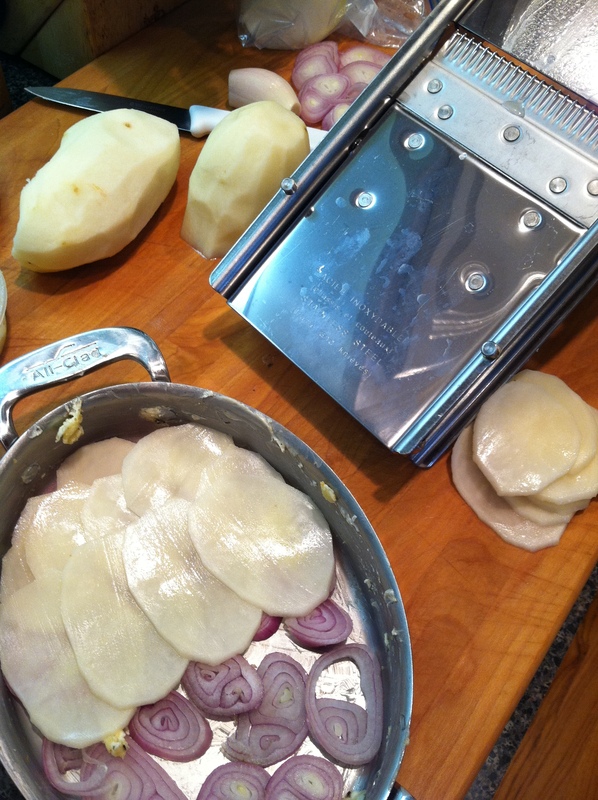 Thinly slice potatoes and shallots by hand or use a mandolin. Be careful when slicing on a mandolin! 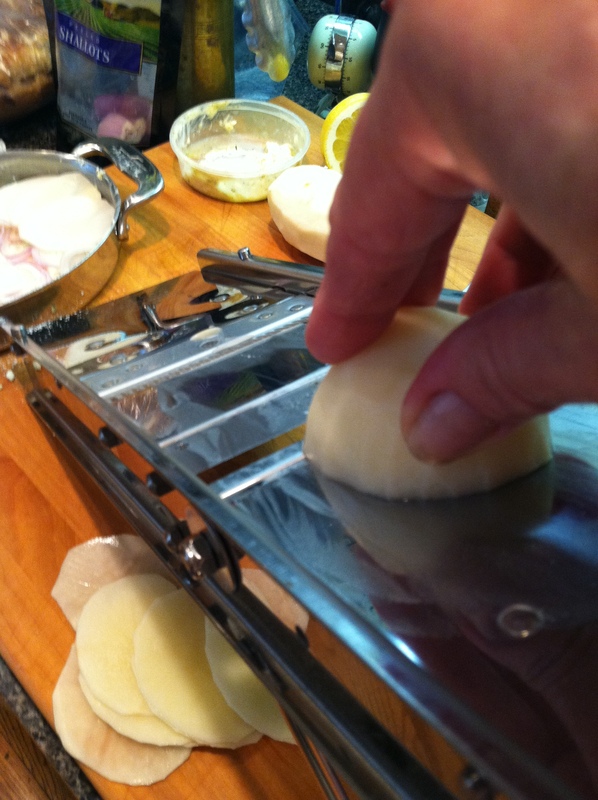 Slicing on the mandolin ensures even slices so they cook at the same rate. HINT: Slice shallots by hand. Butter the dish, place a single layer of sliced shallots on the bottom of the pan, top with potatoes laid in a single layer, top with shredded cheese, spoon 1/4 cup of warm cream, sprinkle with salt and pepper, drizzle a light sprinkling of flour and repeat layering until the dish is full. The top layer should be cheese. 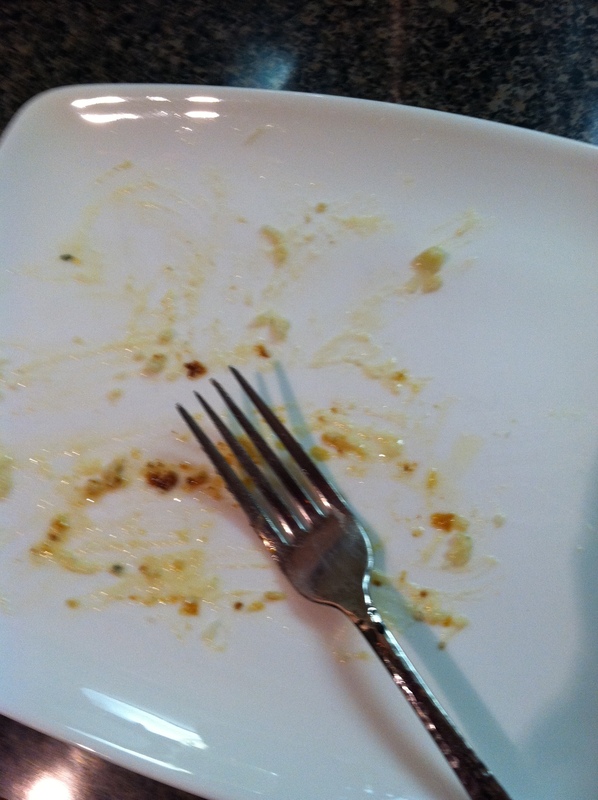 Place the filled dish on a parchment paper lined baking sheet to catch all spills. Place in a 400°F oven for 1 hour or until the dish is bubbling and golden brown on top. We usually gobble these up pretty quickly but if you have any leftover, cut them into shapes and reheat either in the microwave or the oven until nice and warm in the center. 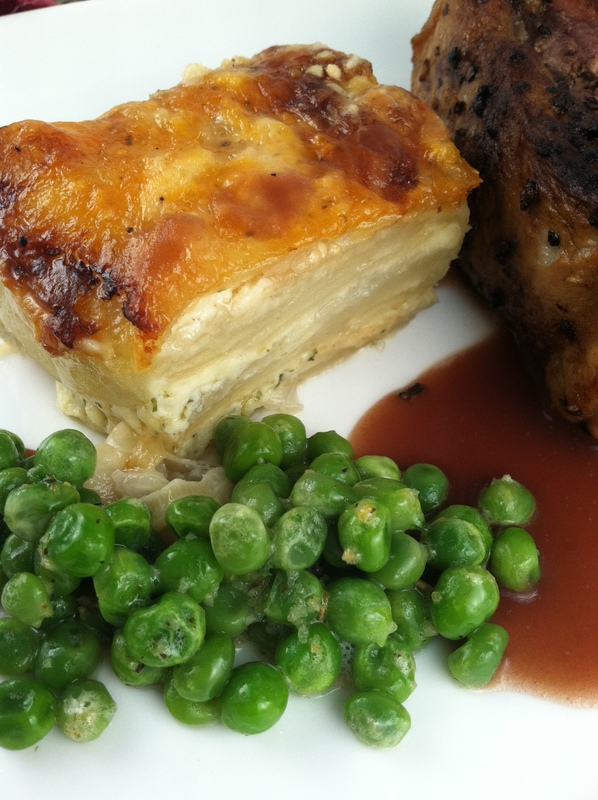 Scalloped Potatoes: Leave out the cheese and make sure enough cream covers the top slightly. 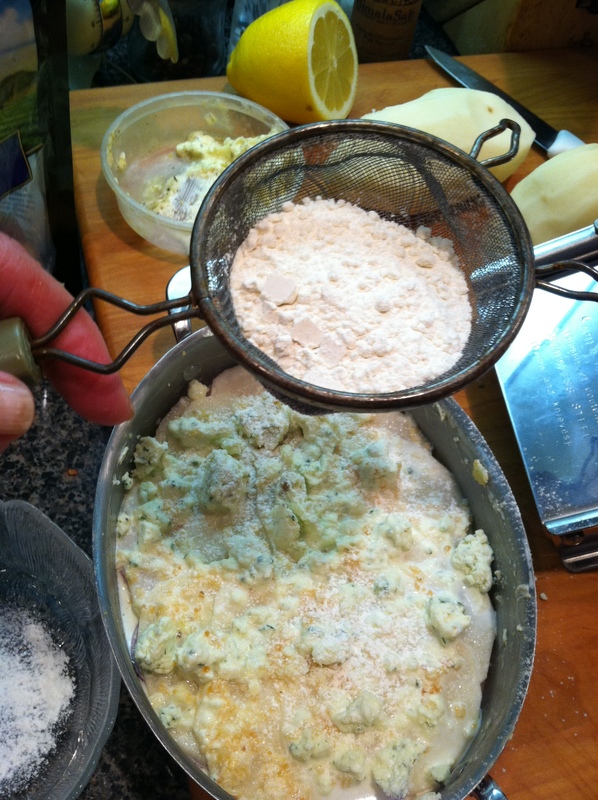 Top with breadcrumbs; Bake the same way. Add your favorite herbs for an herbal variety. Use different cheese: Goat cheese, Havarti, Asiago, fontina, add some bleu to the mix. Use cheese that you know will melt nicely. If you want to make this with cheddar, please add some hoop cheese to it for melting purposes. Cheddar does not melt well all on its own. I’m sure your family will enjoy this as much as mine does. Your home will smell wonderful as they cook. Since they are in the oven for so long, it is a good time to plan a baked chicken or pork chop to go along with the potatoes. 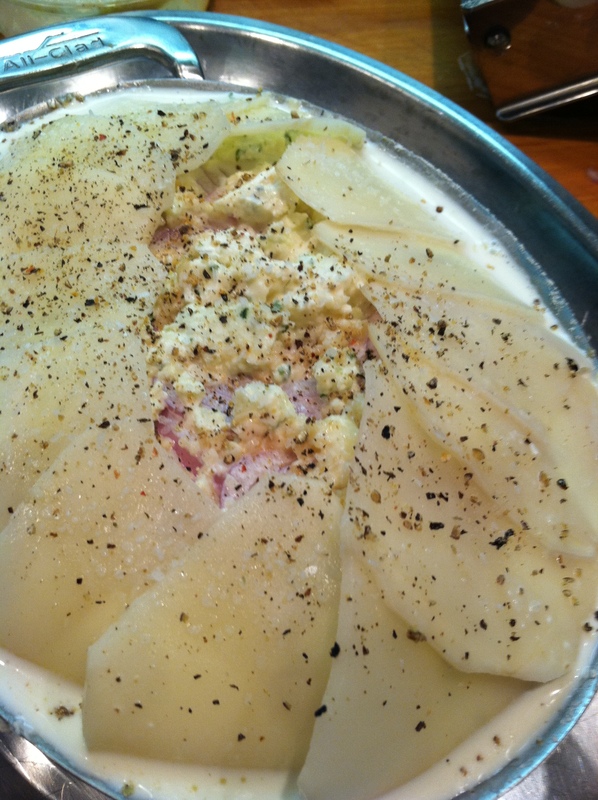 Sometimes I’ll have a plate of just potatoes au gratin for lunch, if there is any left over. 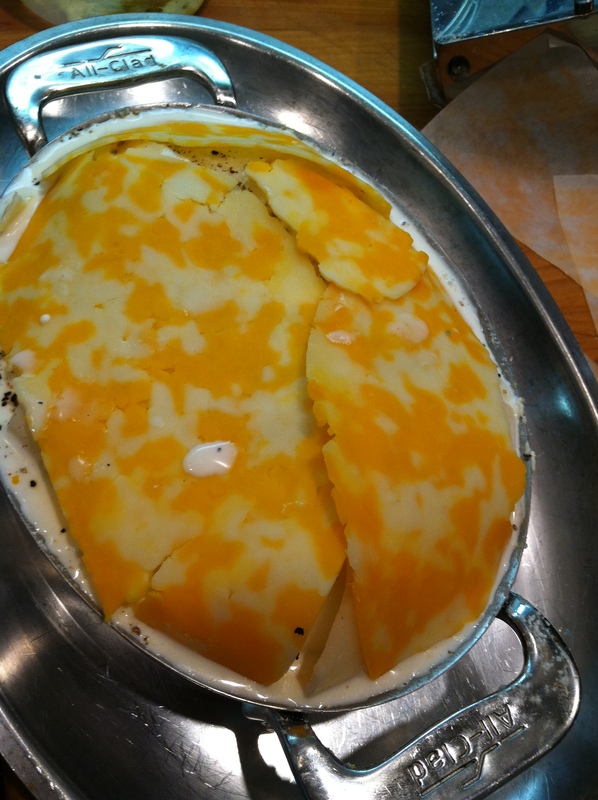 This entry was posted in basic skills, Cooking, Recipes, Southern Cooking, What every good cook should know and tagged All-Clad, Cheese, cook, Cream, dinner, Gratin, Herb, Potato, potatoes au gratin, russet potato, scalloped potatoes. Bookmark the permalink. another amazing, highly educational, post! I never made potatoes gratin, will use your post as a reference first time I try. love your mandoline! What fun! Thank you very much, I am flattered.